Why haven't I made this for so long. It does take a little bit of time to fill all the shells but everyone loves this baked dish so much it's well worth the effort. The best part is, make a whole batch and freeze the rest so that you can take them out for an easy to prepare dinner. I use the inside packaging from the box the shells come in for an easy way to freeze the prepared shells and prevent them from sticking. Served with just a simple tossed salad, this baked creamy classic is a delicious and light comfort dish that everyone will love. Use a plastic storage back to easily fill the shells. Cut the tip off the bag to fill the shells from both ends. Use the plastic containers to freeze the rest. This will prevent them from sticking. 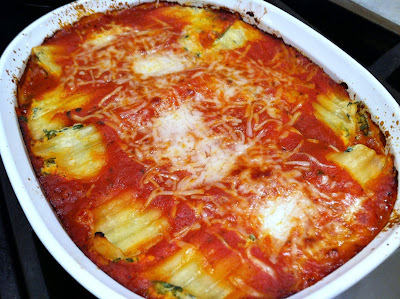 Cook the manicotti for 7 minutes; drain and rinse in cold water. Mix together, eggs, ricotta, Parmigiano, 1 cup mozzarella, basil, salt and pepper and combine well and gently stir in the spinach mixture. Fill the shells from both ends. Spread 3/4 cup sauce over the bottom of a casserole dish and place the manicotti over the sauce. Pour sauce over the shells to cover almost completely. Sprinkle additional mozzarella cheese on top. Baked covered with foil for 30 minutes and uncover for another 10-15 minutes untill all the cheese on top is melted and bubbly.